Our latest selection of second hand (used) violins. These are Ex Rental instruments or have been taken in as part exchange or from customers who have decided to stop playing. Before each instrument is sold it is carefully inspected, cleaned and set up in our workshop ready for you to play. Our stock changes fairly quickly so check back often. Second Hand Violins that are available to rent have a rental button alongside. Before you decide to rent please read our terms and conditions on the rental page. 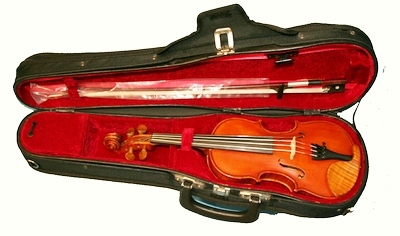 An 1/8 size version of the Primavera 200 violin outfit. 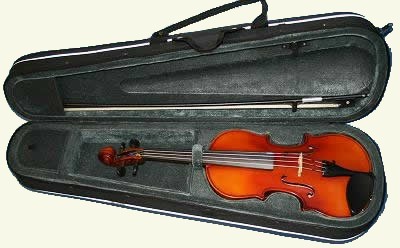 This is the model that won the Best Value Bowed Instrument at the Musical Industries Awards a few years ago. Since then it has been improved with a new Carbon Composite Bow, a new case with a more student proof handle and reflective strips, making it really stand out in vehicle headlights. A useful safety feature. Still made from well selected, hand carved tone woods with Ebony fittings, an excellent student outfit. This one is Ex Rental and in good condition. Used 1/4 size Gliga Gloria outfit. This Gloria model is based on the Gems 1 but fitted with Boxwood Pegs and a flamed Maple chinrest. 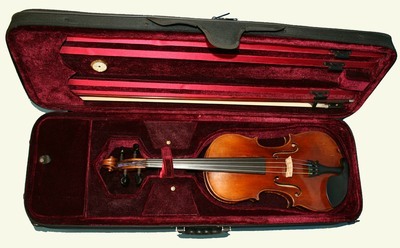 A very pretty and nice sounding violin for that special youngster in your life. Very good condition at 30% below the new price. Nice old Bohemian violin outfit. Recently refurbished with a new set of Dominant strings, pegs, bridge and tailpiece. 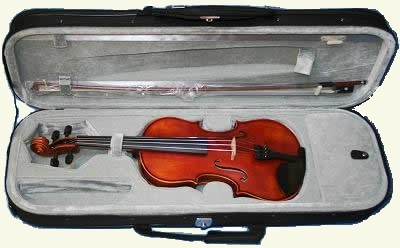 Comes with an oblong case, lightweight Pernambucco bow and Kun Shoulder Rest.